Spartan Apple Crisp, originally uploaded by jasonrr. Yes, another apple recipe! Apples are to fall what zucchini was to summer…readily available, fairly inexpensive and good in just about everything! 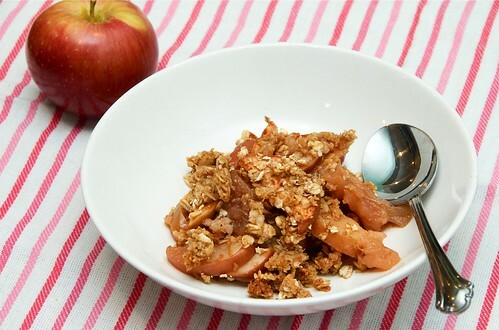 This version of apple crisp is not too sweet and doesn’t need to be saved for dessert. It makes a really good breakfast or an afternoon snack. I used Spartan apples in this because they are naturally sweet and hold up well. Spartans are apparently the first apples produced as from a formal breeding program. I like them because they are equally good for eating and baking. Toss the sliced apples in the spices, tapioca, and lemon juice. Press the apples gently into a baking dish. Combine the dry ingredients for the topping. Using your hands, crumble in the butter and honey until well dispersed. Bake for about 45 minutes at 350 until the juice from the apples begins to run. Allow to stand for about 5 minutes prior to serving for the juices to thicken. You could serve this with ice cream or whipped cream for dessert. I just love a good apple crisp! Yeah, I always eat apple crisp for breakfast! Why wait for dessert? This looks fantastic! mmm, apple crisp! i still haven’t made one this year – this beautiful looking one has inspired me! This is lovely! I was just thinking about what to do with the apples I plan on picking up this weekend. Jillian this looks so good, aren’t apples wonderful!! I love them,great recipe!! Oh I LOVE apple crisp! I’ve never used tapioca in it-will have to give that a try for sure! And I THINK I have everything in the house to make this….my lucky day!! !